Sun, Sea, Sand.. and Sheep! Camping and Caravan Facilities in Robin Hood’s Bay, Whitby. 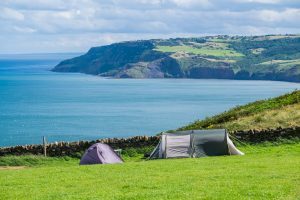 Bayness Farm Campsite is set on the North West Side of Robin Hoods Bay, high on the hill side with stunning views across the bay to Ravenscar. We have availability for tents, caravans and campers, please be sure to get in touch with any enquiries or if you wish to book. Our campsite is central to The Yorkshire Coast, Robin Hoods Bay is only a few minutes drive by car, and we are only a 10 minute drive from Whitby. The famous cinder-track footpath is just below the site and with access from the farm you can take the most stunning of walks into Robin Hoods Bay, or if your feeling that bit more energetic, then Whitby is not too far on foot either. The campsite is situated to the left of the farm buildings it has excellent facilities to cater for both tents and caravans and beautiful sea views across the bay. Read More About Bayness Farm Campsite Here. 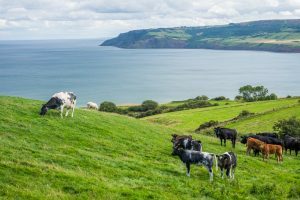 Situated just above the beautiful Robin Hood’s Bay the farm boosts some splendid sea views and breath taking countryside. 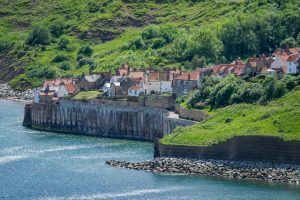 From the farm, across a track access to the old Railway line is found and makes for a short yet picturesque walk (30 mins) to Robin Hood’s Bay. The steep walk down to Robin Hood’s Bay almost takes you back in time. Whether the village has links to ‘the’ Robin Hood we’ll probably never know. Peter N Walker, in his book Murders and Mysteries from the Yorkshire Dales, reckons….